Staff at the UK hospital where brain tumour patient Ashya King was treated have been inundated with abusive calls and emails, it has been revealed. The five-year-old was removed from Southampton General Hospital by his parents, against medical advice, sparking an international hunt. His parents were arrested in Spain, prompting a public outcry. In her blog, hospital trust chief executive Fiona Dalton said paediatric oncology staff had been targeted. "Our switchboard and patient support services were overwhelmed with calls from irate members of the public... and many other people working here were being questioned by patients or the public about this situation, sometimes in a very aggressive way." Parents Brett and Naghemeh King sparked a police hunt when they removed Ashya from hospital on 28 August after disagreeing with doctors about his treatment. They wanted him to have proton beam therapy, which was not available to them on the NHS. The couple were arrested in Spain and spent several days away from their son before the Crown Prosecution Service withdrew the European arrest warrant and they were released. Ashya arrived at the Proton Therapy Centre in Prague on Monday by private jet from Spain. After the family's arrival in Prague, Mr King said: "We've been labelled all sorts of things, from kidnappers to religious fanatics, we've had the police chasing us, we've been arrested, we've spent two days in a Spanish prison, we've had so many court cases. "My son is everything to us so I've got no complaints. You know that, in comparison, what we've been through is nothing. "We're just here, we've made it through, it's like we've been through a storm and we've come out the other end." 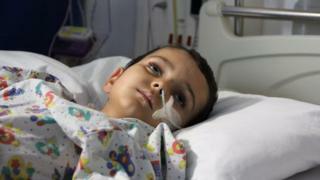 Ashya King case: What is proton beam therapy?